Off-road skateboards are also known as longboards. 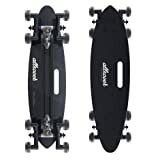 They are almost similar to skateboards but are longer and have higher speeds, especially because of the difference in wheel size and hardware used in its construction. 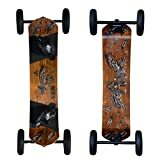 Off-road skateboards are however more intense since they can be used for racing downhill, cruising among other things. They are growing in popularity because they are more stable, durable and even have more, if not better traction. If you have never tried riding an off-road skateboard, below is a review to help you decide on your preferred longboard. Skip to the best Electric Off-Road Skateboards on Amazon. Why should you use an off-road skateboard? Which Off-Road Skateboards are the best? 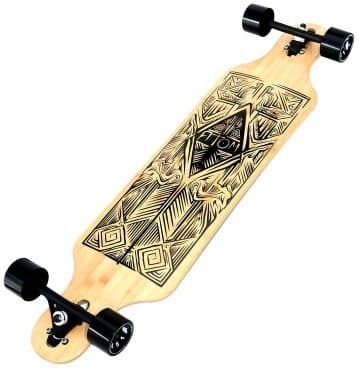 The maple and bamboo deck makes this a great skateboard. The deck is imprinted with heat transfer graphics which give it a badass look. Additionally, this longboard comes with excellent trucks and can climb up to 40-degree. Also, the 180mm hangers enhance performance making this longboard quite a masterpiece. The tough Atom 51-70mm wheels guarantee a smooth run while its ABEC 9 bearings enhance speed with increasing lubrication. This longboard features a tough construction. 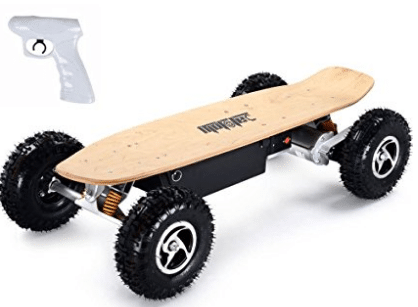 The Moto Tec MT-SKT-1600 Electric off-road Skateboard has the highest capacity so far when compared to all the electric off-road skateboards that we have gone through today. This is evident from it having two motors, each with a capacity of approximately 800w. Having an overall combination of 1600w for its motor power is incredible. That is what also contributes to it having an unbeatable speed of 18- 22 mph. Of course, all that depends on the weight of the person with the off-road skateboard at the time. So, if you consider yourself to be a speedster then look no further, Get yours today, and let the adventure begin. Its battery is 36V 14AH. It has excellent traction on dirt. 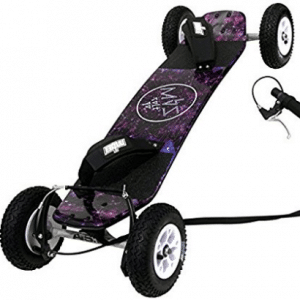 The GT Power board off-road skateboard has a 45-inch long Aluminum deck that is 11 inches wide. To enhance your stability when riding, it has a .75 drop that lowers you a bit closer to the ground. For those who constantly find themselves getting into trouble because of being unable to stop in time, this off-road skateboard has a braking system that is more powerful than the regular off-road skateboard’s break. With this off-road skateboard, you will have a 15-mile range on SLA batteries. Its tires are Kenda pneumatic and low profile. This is yet another great skateboard which is fitted with a unique maple deck. The maple deck is fitted with handles for easy carrying when you’re traveling. And yes, the skateboard features excellent aluminum trucks which are designed to offer a great balance and enhanced performance. Also, there’re eight wheels which offer more turning for quick acceleration. Another thing which makes this skateboard worth a purchase is an all-terrain construction which makes it perfect for all surfaces. And, the heavy-duty and highly flexible V-frame ensures that you have a great experience without fear of breaking. The skateboard is fairly priced given the quality. Just like all longboards from MBS, this is a great product which is designed to offer years of service. The tough wheels cautioned with a high-rebound urethane material ensures that you get ultimate stability and impact suppression. And yes, with great impact suppression, rising is kept smooth for added stability and increased safety. And yes, the extra durable maple deck features heat transfer graphic which makes it even more appealing. Also, the skate trucks fitted with heat treated axles offer excellent impact control for a great experience. The grip-tape offers a firm grip. This off-road skateboard features a top speed of 37 mph. Of course, this speed depends on weight and the terrain. However, regardless of these two parameters, weight and terrain, the speed remains approximately the same. It can climb up to 45-degree radiant which is a perfect aspect. Also, the fact that this skateboard can hold up to 240 lbs. makes it ideal for kids and adults. And also, the brushless motors enhance performance since there’s a motor for each wheel transmission. 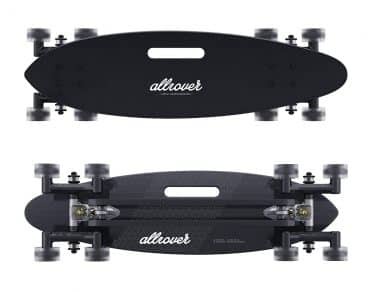 Furthermore, this skateboard comes with a 9000Wh Li-On battery which can last for 2.5 hours on a continuous usage. This way, you’re sure to travel to a very far distance. The pneumatic wheels offer stability and enhanced speed. This wireless controller offer an alternative. This off-road skateboard is about 39 inches long. 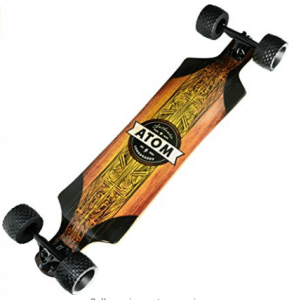 The Atom Longboard off-road skateboard has wheels that are MBS 100mm x 65mm. These wheels are great in all types of terrain, multifunctional objects and wheels mean that you don’t have to get several makes of the same thing because the one you have will suit you in all the different settings and situations that you may end up finding yourself in. your traction off-road will be great, and your speed on road will also be at its height. This is because of the super-high-rebound 78a urethane the wheels have been cast with. The off-road skateboard has a drop deck that is sturdy and maple lam. For added comfort and safety, this is the off-road skateboard to go for! The bearing of the off-road skateboards are ABEC 9 and shielded with rubber. The bearings also have specific lubricants for high speed. If you are a beginner then pay attention. The MBS Colt 90X off-road Mountain skateboard has a V brake system, and five-star hubs. Since you are new to the off-roading world, it’s best that you pick an off-road skateboard that projects high standards, right from its look down to its manufacture. This off-road skateboard has tires that are genuinely MBS 8 inch T1. To ensure that your foot fits accordingly, these off-road skateboards are made with F1 Velcro bindings that can be adjusted as desired. By now I’m sure you can see that you will be spending money on a very thoughtful product, not something that you will buy only to store it away. The MBS Colt 90X off-road Mountain skateboard also has a design that stands out and you can show off with. 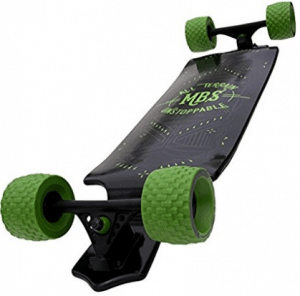 The MBS Colt 90X off-road Mountain skateboard is faster than the previous year’s version. Air loss from its tires has been reduced, by upgrading it’s the material of the tube to highly graded butyl rubber. When you buy this off-road skateboard, it will be brought to you when it’s fully assembled. If you have been discouraged in the past to try out off-roading simply because you couldn’t get yourself the right longboard to fit you, then the time has come to give it one more try. The MBS All-Terrain Off-road skateboard will give you a new outlook on things simply by changing your entire experience. It keeps your center of gravity low enough for the ultimate off-roading and pushing. Don’t deny yourself the chance to get it right with the right tool at your disposal. It’s like they say, it’s better late than never. The large wheels offer added maneuverability as you move at high speeds. The wheels of this off-road skateboard are 100mm x 65mm. Its maple drop deck is stiff and 10ply. 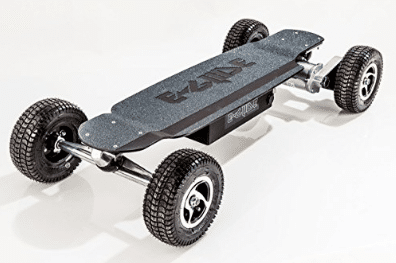 This electric off-road skateboard cranks an incredible 2000 watt which lets you accelerate comfortably and conveniently. It offers speeds of up to 18.6 mph which is a great speed. And yes, the top grade construction guarantees durability. It boasts a tough Canadian maple deck which is designed to offer unrivaled durability. What’s more, the high-quality lithium batteries used to power up the skateboard offer up to 3 hours of continuous riding. Of course, riding for three hours at a speed of 18.6 mph would take you quite far. Furthermore, this skateboard is fitted with excellent pneumatic tires which guarantee a smooth ride and ideal acceleration. Electric Off-road skateboards have more speed compared to actual skateboards. This means that you won’t have to worry about going at low speeds. If you want to surprise your pals with styles and unmatched speed, you need to try getting an off-road skateboard. Off-road skateboards tend to last longer, hence are more pocket-friendly in the long-run. Looking at the long-term benefits, you won’t have to frequent the market looking for replacements which mean that you’ll save cash at the end of the day. Off-road skateboards will let you experience a variety of sports and adventurous activities. To pull those tricks and enhance creativity white skating, off-roads hoverboards are simply the best! Off-road skateboards are more user-friendly than the usual skateboards. Of course, off-road skateboards ensure that you’re safe and secure as you do the magic odd the roads. This offers adequate convenience and ensures that you get a better experience. Terrain friendly: Some off-road skateboards can only be used on specific terrain while others are all terrain. Depending on your location be sure to get one that can withstand the terrain around you. Wheels: Get an off-road skateboard whose wheels you will be comfortable with, and will have a better grip on the surface you intend to use it on. The wheels will also help you determine your speed. Assembly: Make sure to confirm whether the off-road skateboard you are using will be delivered to you fully assembled or not assembled at all, this will help avoid inconveniences. The GT Power board off-road skateboard has been constructed with European electronics that are industrial grade. The company itself brags about having the best of the best when compared to all their global competitors. It can take its place as our top recommendation because of all these factors and the fact that its reliability and advancement is unquestionable. Some of us were born naturally attracted to situations that make our hearts race and the adrenaline pumping. The so-called daredevils and adrenaline junkies are the types of individuals who feel more alive when exposed to such situations. The Moorhaus electric off-road skateboard is the best one for you if you happen to fall under any of those categories. For maximum speed, all you have to do is the power it up to 1000 watts and you’ll find yourself almost flying off at a speed of 20+MPH. Get out of your, comfort zone and try it this off-road skateboard for the time of your life. It has a brushless motor that is the best in the market. It has a battery that is sealed lead acid. This Atom 95X Mountain Off-road skate Board is a great fit for most households. This is because it can be used for recreational purposes by everyone from the teenager to the adult. It the perfect choice since it can be shared and the price is pocket-friendly. This Atom 95X Mountain Off-road skate Board has a grip tape made of 46 grit aluminum oxide. Its suspension is an orange bushing, the hubs are tri-spoke and the tires are diamond tread and 8 inches in size. The off-road skateboard can also be used on all terrains, further proving its worth as an economical buy. It has a V4 brake kit and an axle that is O.D. : 9.5mm. The bearing of this off-road skateboard is 9.5X22mm. This is another off-road skateboard that I would ask beginners to pay attention to. The reason behind my statement is because as a beginner you will need to be on very high alert when it comes to matters of safety and comfort. 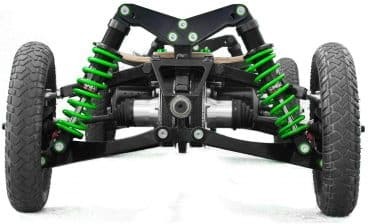 The MBS Comp 95X Mountainboard has a V5 MBS brake system that will definitely help reduce any level of risk you may come across in challenging terrain. To ensure that you experience comfort at its maximum, the off-road skateboard has dual density foam with its F5 ratchet bindings. 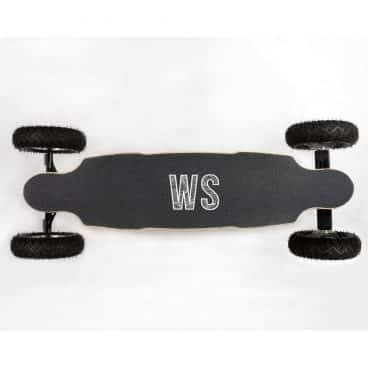 The tires are 9 inches in size and are extra-large MBS T2 tires for enabling the longboard to handle different terrain. The deck of this off-road skateboard has system and multi-chamber. This is the second electric off-road skateboard that we have on our list today. This off-road skateboard from air-wheel, however, has more features though that are quite impressive. For starters, you will be able to control your off-road skateboard using a remote that is wireless. If you have a smartphone, you are in luck because you can also connect it to your smartphone app using Bluetooth. 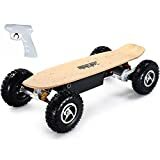 I would most likely recommend this off-road skater board to individuals who are tech-savvy and like to keep up to date with the latest gadgets and such. The best part about it is that you don’t need to be experienced in longboarding, anyone has the potential to immediately master how to use it. The off-road skateboard’s direction can be changed using the remote’s direction button. It comes in only two options, either black or multi-color. 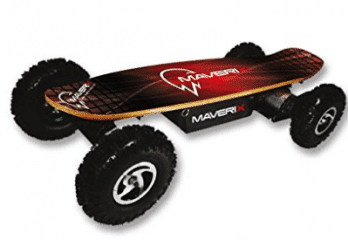 The highest speed the Maverix USA Border X off-road Skateboard can ride at is around 19 MPH. In only one charge, you will be able to ride for 7 to approximately 9 miles. This off-road skateboard has a 3*12 Ah battery and its battery life can last until a distance of about 12 to 15 km. I find that to be extremely reliable, since you won’t find yourself getting stranded and having to walk or get frustrated, depending on where you will be at the time. The off-road skateboards remote has 3 different speeds. You will be able to use your off-road skateboard whether you are on a dirt road, on sand, gravel and even on the beach. It uses up to 800w.